One of my early quilting classes was a Block of the Month at Hancock Fabrics. This was not it. 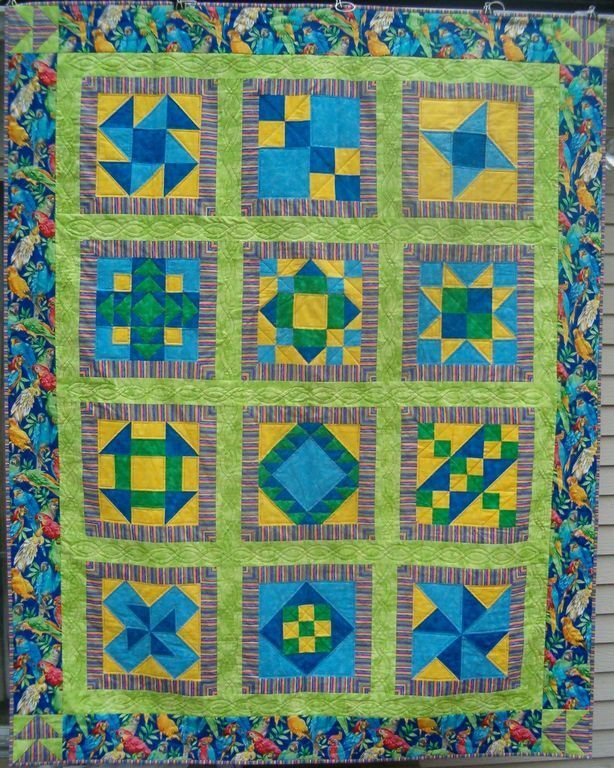 This was the previous year’s quilt and I bought the blocks on clearance. I have no idea how the quilt was to be originally set, so the blocks sat waiting for inspiration to strike. I first found the stripe fabric, then the border fabric and finally the bright green. My notes indicate I started the quilt in March 2005 and finished it November 28, 2005 – obviously before my UFOs needed to age a year or more. The quilt measures 70″ x 90″ and is quilted on my sewing machine. The batting is probably Warm and Natural. The backing (which I don’t have a picture of is a mish-mash of the left over fabric. I gave it to my oldest niece for Christmas when she was about 12. I scanned the fabric to grab a bird. The label was created in my word processing program and then printed on “dark t-shirt” transfer material which I fused to a piece of the sashing fabric. I believe that the BOM you have here was started way before 2005. More like 2003. I have the same blocks waiting on sashings. I like your Bird on the label too. Who is the lucky person who gets this jewel? I too have several of these BOM’s sitting in their chackages. Waiting for me to put the squares together. I did not purchase the find setting fabric for each set. So you have given me some inspiration to get back into the sewing room and do a block a night; then fine fabric to finish them off. Then give to the kids.